Rockefeller Center is a complex of 19 commercial buildings located between 48th and 51st Street in Midtown Manhattan. The Top of the Rock Observation Deck, one of the major tourist attractions of New York, is on top of the Comcast Building at Rockefeller Center. Also the headquarters of NBC Television Network and Radio City Music Hall are part of Rockefeller Center. 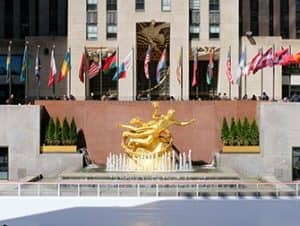 During the Rockefeller Center Tour you will learn more about the rich history and architecture of Rockefeller Center. An expert historian will take you through the most important buildings, gardens and spaces of the complex. The tour lasts about an hour and gives you the opportunity to see Rockefeller Center in a very different light. 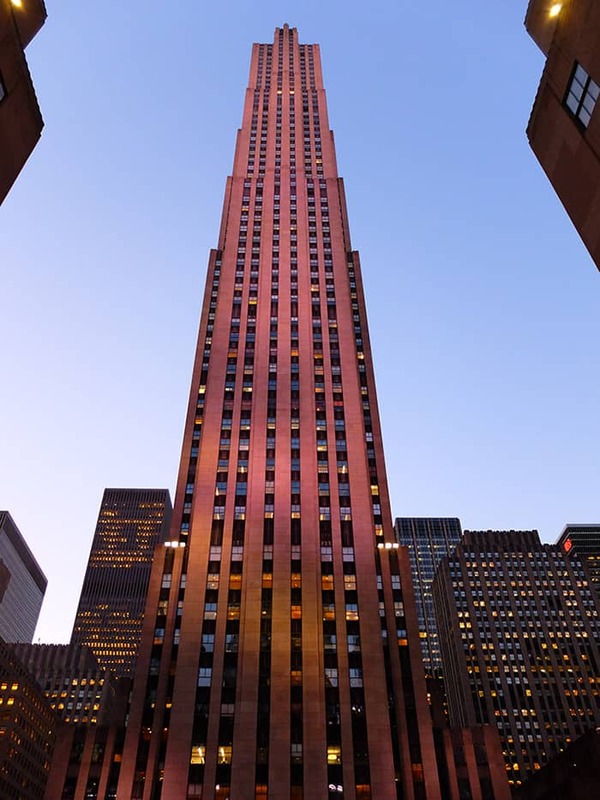 Rockefeller Center and the observation deck were a gift from John D. Rockefeller to Manhattan. In building Rockefeller Center, he wanted to create a space where visitors and locals could marvel at the city. Rockefeller Center has known many ups and downs since its completion in 1933. 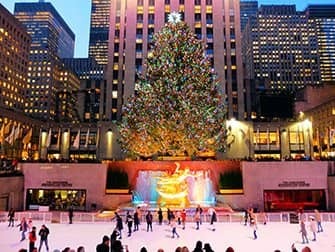 The Rockefeller skating rink first opened in 1936. Initially it was designed as a temporary ice rink to attract the crowds, but eventually it became an annual event. 150 people can skate at once on the skating rink. You can find more information about the ice skating rink here. The 1940s were prosperous for Rockefeller Center: more than 90% of the commercial buildings were rented. Rockefeller Center hit a rough patch in 1970s with the economic crisis, leaving many of the buildings vacant. But in the 1980s, it made a comeback when the trade market was booming and people could become shareholders. In addition, the Rainbow Room, on the 65th floor, reopened after a $20 million renovation and Frank Sinatra’s five performances at Radio City Music Hall in the ‘90s were sold out! After another setback in the ‘90s, new investors were found. Thanks to these investors, the underground subway station was renovated. The 20th century was about recreating John D. Rockefeller’s original vision to “create a place for locals and visitors to marvel at the city he loved”. After renovations of almost 20 years, the Top of the Rock Observation Deck at 30 Rockefeller Center opened again to the public. The observation deck had been closed from 1986 to 2005, primarily because of major renovations elsewhere in the building. After that, Rockefeller Center faced financial troubles. Eventually, the Top of the Rock itself was renovated and finally reopened in November 2005. Currently it attracts over 2.5 million visitors per year. The Rainbow Room is a restaurant and event space that re-opened in September 2014 after lengthy renovations. 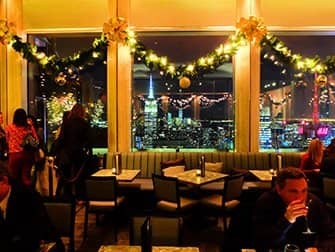 This place is very fancy but what else would you expect from a New York landmark that is situated on the 65th floor of Rockefeller Center in New York City? If you want to go to this restaurant, ask for a table by the window – of course! 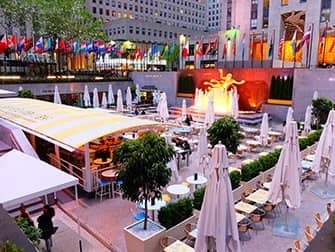 Bar SixtyFive, like the Rainbow Room, can also be found on the 65th floor of Rockefeller Center. Here they serve cocktails and small bites. If you are looking for something to do that is a little exclusive, it is definitely worth a visit. Go, for example, before or after seeing a show at Radio City Music Hall or on Broadway. In addition, from Bar SixtyFive you can enjoy a beautiful view over Central Park and the city. Although, you don’t get 360 degree views like you do at the Top of the Rock, and in the winter you can’t go outside. Bar SixtyFive is a little more accessible than the Rainbow Room, however it is expected that you dress up. The dress code is cocktail chic, for men it is recommend to wear a shirt, jacket and dress shoes. Flip Flops, sneakers, sports clothes, jeans or shorts and torn trousers are not permitted. Cocktails cost around $20. NBC (the National Broadcasting Company) moved to Rockefeller Center in 1933. Thanks to the studios, the American public has been able to enjoy many shows such as the Today Show and Saturday Night Live. When NBC made the switch from radio to television, more than 2,400 kilometres of wiring was needed. In 1994, the Today Show broadcast was aired at street level.